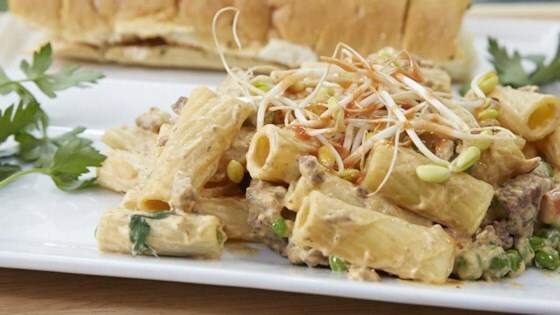 "Rigatoni is artfully dressed in a spicy cream sauce with carrots, shallots, and peas for a pop of color. Serve garlic bread topped with parsley and paprika, if desired. This recipe is made in a Panasonic CIO and appears on an episode of the Dinner Spinner TV Show on The CW!" Preheat oven to 425 degrees F (220 degrees C). (If using a countertop induction oven, preheat to 325 degrees F (165 degrees C).) Place garlic bread, cut-side up, on a baking sheet. Bake in the preheated oven until bread is warmed through and lightly browned, 10 to 15 minutes in the conventional oven and 5 minutes in the countertop induction oven. Bring a large pot of lightly salted water to a boil; add olive oil. Cook rigatoni in the boiling water, stirring occasionally until tender yet firm to the bite, about 13 minutes. Drain. Heat a large nonstick skillet over medium heat. Add ground beef, 1 1/2 tablespoons jerk seasoning, onion powder, salt, parsley flakes, and white pepper; stir in brown sugar. Cook and stir seasoned ground beef until browned and crumbly, 5 to 8 minutes. Transfer seasoned ground beef to a plate. Melt butter in the same skillet over medium heat. Add carrots, shallots, peas, and parsley; cook and stir until lightly browned, 8 to 10 minutes. Mix carrot mixture, rigatoni, and ground beef together in a large bowl. Whisk cream cheese, sour cream, hot sauce, 1 teaspoon jerk seasoning, and dried thyme together in a bowl until well blended; stir in rigatoni mixture. Top rigatoni mixture with a pinch of jerk seasoning. Scatter bean sprouts on top. Serve garlic bread on the side. This is a great, quick and easy meal to make on busy weeknights. Just the right amount of ground beef, veggies, and sauce. Excellent pasta recipe! I wasn't too sure about the ground beef with a cream sauce but it was yummy. Next time I might flavor my beef differently, or mix in some chorizo.